“Oleo de la época sobre la Batalla de Santa Rosa. Imagen suministrada por el Museo Histórico Cultural Juan Santamaría”. 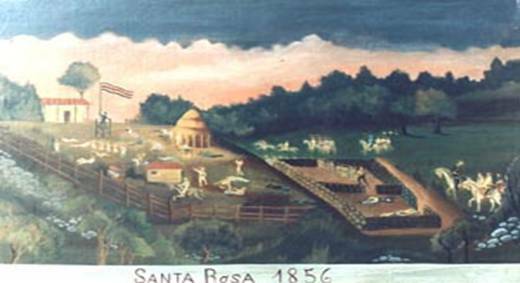 The Battle of Santa Rosa was a battle between the forces of Costa Rica and Nicaragua. Nicaragua forces were led by William Walker, a Soldier from Nashville, Tenessee, US that believed in Slavery and wanted to convert all of Central America into slaving territory. It was one of the most important battles in the history of Costa Rica. The battle took place on March 20, 1856 at Hacienda Santa Rosa, Liberia, Costa Rica. Today is a historic old house preserved as a monument in center of a beautiful national park. The fighting was caused by the arrival of William Walker in Nicaragua. He arrived to Realejo Port in Nicaragua with 57 soldiers. He convinced Patricio Rivas, the president of Nicaragua , to attack Costa Rica and extend his domain to all of Central America to make it a slave empire. The president of Costa Rica, Juan Rafael Mora Porras realized that Walker wanted to conquer them. On February 27, 1856, Mora declared the war against Walker and Nicaragua. President Mora requested to all Costa Ricans between aged 15 and 50 to go to fight, because the army was very small. This brought together a group of ten thousand men ready to fight against Walker. On March 4th, Joaquin Mora (brother of the president of Costa Rica) led the forces as they started their march towards Nicaragua, at the same time, the filibusteros made their way to Costa Rica and settled at Santa Rosa, in the province of Guanacaste. On March 12th, they arrived in Liberia. There they join with Jose Maria Cañas and his battalion. On March 20th, the then thousand Costa Ricans walked to Hacienda Santa Rosa where the filibusters had formed their post at La Casona. At four o’clock, the Costa Rican battalions began the attack against the invaders. After eighteen minutes, the Costa Rican forces won the battle. The few filibusters that had escaped went to Nicaragua. William Walker armed a new army. President Mora quickly moved on to Rivas with his 10000 men, and the Battle of Rivas started. Previous Previous post: October 31st Mascarada Puppet Days : The Tico Hallowen day.